The tides are turning against US-funded mobs in the streets of Hong Kong amid the so-called “Occupy Central” protests, as increasingly impatient residents and business owners come out into the streets to confront protesters. At times outnumbering and overwhelming the “Occupy Central” protesters, the movement represents residents, business owners, and by-standers attempting to restore normality to Hong Kong’s streets after the government and police have so far been unable to do so. Image: Within articles claiming an ongoing and growing backlash against Occupy Central protesters is led by “triad” gangsters, are pictures of angry residents who are clearly not triad members. 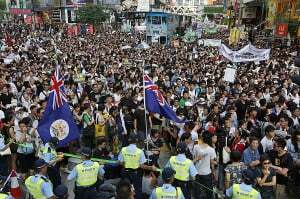 Pro-democracy protesters were besieged by violent mobs looking to break up their occupation of one of Hong Kong’s busiest districts on Friday, leading to chaotic skirmishes on city streets, accusations of police bias, and the shelving of negotiations with the government. Image: Triad gangsters across Chinese society including mainland China, Hong Kong, and Singapore, generally sport large conspicuous tattoos on their upper bodies, are young, and very easy to spot, even when they attempt to blend in when attempting to put their days of organized crime behind them. In Singapore particularly, public awareness campaigns ask employers not to judge former triad members on their appearances. It is unlikely that thousands of “triads” could come out onto the streets of Hong Kong and the Western press failed to capture any pictures of them – meaning their claims of “tirades” confronting Occupy Central protesters is a fabrication. So conditioned is the ordinary reader of Western newspapers that headlines directly contradicted by the content of the article as well as accompanying pictures goes unnoticed. However, for a growing number of increasingly astute segments of the global public, such discrepancies are beginning to stand out with startling conspicuity. 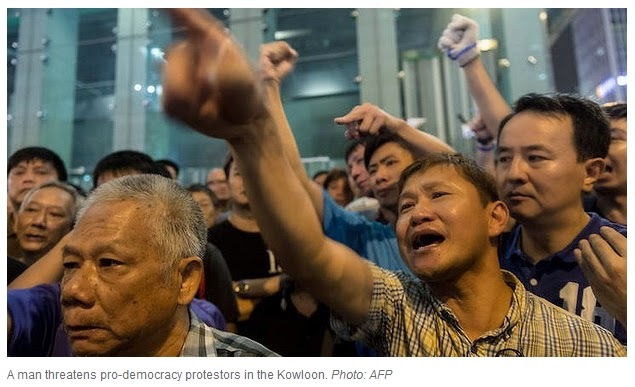 They myriad of growing lies surrounding the US-engineered chaos in Hong Kong’s streets is but one part of a much larger, long-term campaign to contain, co-opt, or collapse China’s political order, and replace it once again with Balkanized colonial proxies.